Barack Obama is the commander in chief of the most powerful nation in the world. He oversees more than 2 million federal workers, attends countless meetings, and makes numerous public appearances, duties all requiring that his schedule be mapped out by the minute. But when it comes to parent-teacher conferences, President Obama is just like every other working parent, forced to take off from work in the middle of the day to travel to his children’s school. The president’s visits to his daughters’ school underscore the unrealistic expectations that schools too often have for working parents and the ways in which school policies put pressure on already stretched families. By closing at 3:00 p.m., shutting down intermittently and frequently, hosting important school events in the middle of the day, and more, schools make it really hard for parents to balance their commitments to their children and their jobs. In fact, when it comes to school schedules, President Obama might actually be lucky. His job at the White House is flexible enough to allow him to make time to travel to his daughters’ parent-teacher conferences and other school events. Many working parents do not have that autonomy. In fact, nearly half of all workers report not having any form of flexibility in their work schedules. Almost 40 percent of all workers do not even have paid vacation time. The world has evolved dramatically since the public school schedule first took root. When the school day first evolved, millions of children—many as young as 10 years old—worked, and most mothers stayed at home. Today, child labor for the most part is outlawed, and 75 percent of women with school-age children work. How misaligned are school and work schedules? What can schools do to support parents as they try to meet their obligations to their employers and to their children? How can schools and districts pay for this effort? There’s a short answer to this last query because 9-to-5 school reform is less expensive than most people believe—and does not require teachers to work more for less pay. To examine these questions, the Center for American Progress analyzed the calendars, schedules, and policies of the largest school districts in the country, which serve almost 6 million students. CAP researchers also examined data from the National Center for Education Statistics. The resulting analysis reveals the multitude of ways that U.S. public schools make life unnecessarily harder for working parents. Throughout the school year, schools are closed for 29 days, more than two workweeks longer than the average private-sector worker has in paid vacation and holidays. While the average private-sector worker with paid leave has 16 days off in paid holidays and vacation, the largest school districts shut their doors for an average of 29 days each school year. This 29-day figure excludes summer recess but includes days off during the school year for staff training, special programs, and seasonal breaks, as well as major federal and state holidays such as Memorial Day and Patriots’ Day in Massachusetts. The New York City and Los Angeles school districts have more days off than most—33 and 34, respectively. As a consequence, even if full-time workers devoted all of their paid vacation time and holidays to cover school closings, they would still need to find an alternative way to care for their children on at least 13 days throughout the school year. Notably, the reasons for some closings have little to do with a school’s core mission. Some districts will close on the opening day of hunting season, for instance. This analysis understates the scope of the problem. First, many working parents do not have paid leave. Part-time workers, for instance, make up 19 percent of the U.S. workforce and are far less likely than full-time workers to receive paid leave. In fact, only about one-third of these workers receive paid vacation time. What’s more, 21 percent of workers are contract workers or under temporary hire—such as agency temps, on-call workers, and independent contractors—and have limited if any access to paid leave. Overall, 39 percent of all workers, and 80 percent of low-wage workers, lack access to paid vacation time. Forty-three percent of all workers also lack access to paid sick leave. If families pay out of pocket for child care to cover the excess school closure days and hours, it would cost an average of $6,600 per year, or 9 percent of an average family’s income. Even families who have paid leave are forced to find other ways to take care of their children when school is closed once they have exceeded their leave benefits. If parents were to pay child care workers their average hourly rate in the United States—$10.72—for every excess day and hour that schools are closed while they are at work, they would owe $6,600 annually. That amounts to 9 percent of $70,000, the median income for family households with school-age children. Low-income workers obviously would pay a higher percentage of their income. Families in the lowest income quintile, for instance, earn just $29,000, and for them, paying $6,600 for child care is simply out of reach. The typical school day does not reflect normal work hours, and most schools close two hours or more before the end of the typical workday. The median school day ends at 2:50 p.m., and virtually every district in the country is closed by 3:30 p.m. Some districts, such as Palm Beach County in Florida, end the school day as early as 2:05 p.m. in their elementary schools. Most districts also hold half days on the first or last day of student attendance, and many schools close as early as 1:00 p.m. once per week. Meanwhile, 70 percent of parents report working between the hours of 8:00 a.m. and 5:00 p.m.
Key school events such as parent-teacher conferences are usually scheduled during the day. Districts typically conduct parent-teacher conferences during morning and afternoon hours, when most parents are at work. Most districts also close for a full day or several hours early for parent-teacher conferences, even if these meetings last less than 10 minutes per family. The Dallas Independent School District in Texas, for instance, closes school at least twice per year for parent-teacher conferences. In Cobb County, Georgia, elementary and middle school students receive an entire week of early dismissals due to these conferences. Misaligned school schedules cost the U.S. economy $55 billion in lost productivity annually. School schedules create more than just inconveniences—and additional costs—for working parents. They also drive down economic productivity. First, they result in lower levels of full-time employment among women with elementary-school-age children. According to CAP’s analysis, the gap in full-time employment rates between mothers of elementary-school-age children and mothers of middle- and high-school-age children suggests that more than 1 million fewer mothers of elementary-school-age children are working full time, forfeiting an annual median wage of $35,000. This lost productivity costs the economy about $35 billion every year. The authors have dubbed this issue the “Stay-at-Home” problem. Second, the economy loses productivity due to school closings. When school is closed, many parents have to take time off from work in order to care for their children. To quantify this type of productivity loss, CAP estimated the number of lost hours due to school closings and multiplied it by the average hourly wage of women with elementary-school-age children in the United States. The authors limited the pool of affected workers to households where all residing parents are employed. The result: lost productivity of $20 billion due to school closings. The authors call this issue the “I Don’t Know How She Does It” problem. When the authors added these two different analyses together, the figures summed to $55 billion in lost productivity each year due to misaligned schedules. Fewer than half of elementary schools and fewer than one-third of low-income schools offer before- and after-school care, and when offered it is often unaffordable. One of the most basic ways that school districts can try to address the gap between school and work schedules is through before- and after-school programs. But only around 45 percent of all public elementary schools actually offer before- and after-school care, according to CAP’s analysis of federal data. In several states, in fact, only 15 percent of public schools offer before- and after-school care. In Utah, the figure is as low as 3 percent. Low-income schools are actually less likely to offer after-school programs than other schools. Nationally, only 31 percent of Title I schools offer such programs, for instance, compared with 40 percent of schools not eligible for Title I funding. Even worse, of the districts that do offer after-school care, few ensure that they are free, discounted, or progressively priced. In this report’s survey of the nation’s largest districts, fewer than one-third make after-school care cheaper or completely free for low-income families. The misalignment of school and work schedules has a disparate impact on black, Latino, and low-income working parents. While the misalignment between school and work schedules affects all working parents, this issue disproportionately affects lower-income families. Lower-income workers are more likely to have unpredictable or inflexible work schedules, which makes it difficult for them to arrange child care immediately when needed. These parents are also less likely to have paid time off. Just 53 percent of hourly workers have paid vacation days, compared with 71 percent of salaried workers. Lack of paid leave hits many people of color particularly acutely, since they are far more likely to hold hourly shift jobs that are less flexible. Many workers of color also earn less than their peers, which means that they are less financially able to cover any sudden cost of additional child care. Among full-time working women, for instance, African Americans earn only 81 cents on every $1 whites make and 67 cents on every $1 Asians earn. Hispanic women or Latinas earn 75 percent as much as whites and 62 percent as much as Asians. Most low-income schools and districts currently receive funding that can be used to improve school schedules, with the costs of a 9-to-5 school day within the bounds of current allotments of federal funding. While most schools will need increased funding—and flexibility—to expand school schedules, the authors found several federal funding sources that currently support efforts to redesign the school day, reform the calendar year, rethink professional development, or improve access to quality after-school programs. For instance, as part of the Every Student Succeeds Act, or ESSA, schools receiving grants under Title I, Part A could use these funds to lengthen the school day. More than 56,000 public schools currently receive grants through Title I, Part A, but few schools are using these funds to improve school schedules. ESSA also contains other funding streams for longer school days, including through the 21st Century Community Learning Centers program, Student Support and Academic Enrichment Grants, and the newly authorized Promise Neighborhoods and Full-Service Community Schools programs under Title IV. As part of their research, the authors also found that the cost for a 9-to-5 school day is somewhere around $4 to $5 per student per hour, though often much higher, depending on staffing and other factors. So if a school has around 500 students—which is the average size of an elementary school—then the costs would be around $2,000 to $2,500 per additional hour. This is about the size of Title I grants for many schools, and it means that schools could pay for the reforms using federal dollars. Health policies and weather-related closures foist additional, unexpected days off onto working parents. Every child gets sick unexpectedly. On average, students miss around three days of school due to illness per year, and 15 percent of students report missing more than a week of class. But some districts have a take-no-prisoners approach when a child falls ill at school. In Duval County, Florida, for instance, parents are expected to pick up their child from school within 60 minutes of when they are notified. Many schools also forbid students from attending school if they are found with nits, which are the eggs that form lice. Yet many organizations have argued that nits are not contagious enough to require a student to go home. Inclement weather is another source of unexpected school closings. While student safety should always be of top priority, school districts should ensure that their decisions on weather-related closings and delays are aligned with major employers in the area and local government offices, which often is not the case. While these findings may seem obvious to anyone who has attended school or parented a school-age child, they have been accepted as the normal way that schools do business by parents, voters, and society. The typical school day and year comes nowhere close to aligning with the work schedules of most parents. These shortened, rigid, and unpredictable school schedules not only affect parents’ day-to-day workloads, but they also reduce valuable learning time in the classroom, which negatively affects student achievement. To improve the lives of working families and boost student outcomes, CAP recommends policy changes at the federal, state, and local levels to align school and work schedules. These policy solutions should extend the length of the school day, reduce the number of school closures, reform the calendar year, and rethink engagement strategies. Foster innovative approaches to aligning school and work schedules and supporting working parents. The president should use his convening power to host a White House conference on supporting working families through improved school schedules, and the convening should bring together diverse stakeholders to solve these problems. The U.S. Department of Education should build on this work by creating and supporting a working group of school, district, and major community-based organization leaders who are committed to working on this issue and sharing best practices. Through guidance—and future legislation—the federal government should also send a clear message that districts ought to align the schedules of schools with the typical work schedule more closely, and they ought to prioritize schools serving students from disadvantaged backgrounds in ways that improve student outcomes. Promote the use of Title I, Part A dollars for expanded school schedules, and increase other federal funding sources for a 9-to-5 school day. Title I, Part A funds carry a fair amount of flexibility, as school districts can use the funds “for any activity that supports the needs of students in the school.” In other words, high-poverty schools can use funds from Title I, Part A to pay for 9-to-5 schools as part of a larger effort to boost achievement. Congress should also appropriate additional funds for the 21st Century Community Learning Centers program, Promise Neighborhoods, AmeriCorps and the Full-Service Community Schools Program, as well as other federal funds that support schools and communities by providing wraparound services, after-school activities, and longer school days. Create a pilot program that supports a 9-to-5 approach to schooling. The federal government plays a key role in promoting innovation, and CAP recommends that a new competitive grant program be included in the Higher Education Act, which is due for reauthorization. This new program would encourage graduate schools in social work to partner with neighboring public school districts in developing a 9-to-5 school schedule. These sorts of university-school partnerships have already shown success within the community schools space, particularly in the “university-assisted community model.” In this model, undergraduate and graduate students help lead the expanded-day programs, and faculty members use their expertise to contribute to strategic planning, fundraising, and curriculum development. Promote the 9-to-5 school day and compensate teachers who want to work longer hours. While teachers should not have to work longer hours without additional compensation, states should support more schools that align with typical work schedules. Just as states create and support schools specializing in bilingualism, technology, the health professions, and more, states should also support the development of a “9-to-5 school,” a new theme-based option for parents. These efforts should be funded at the state level and become part of a district’s portfolio of schooling options. This should be done through a competitive grant program that is targeted at low-income schools. In states with statewide salary schedules, states could create policies that would allow schools to compensate teachers with additional pay for a 9-to-5 school day. Rethink their requirements on instructional time. Current state guidelines on instructional time are outdated. In some states, no requirements on the length of the school day even exist. States should increase the minimum number of hours that students are required to be in school. If states raised the minimum length of a school day to eight hours, for instance, this policy change would naturally lead to school schedules more aligned with the typical workday. This change would also allow more time for physical education, recess, enrichment, and electives. Offer family-centered schools. Districts should introduce a new school model of choice called family-centered schools into their portfolios. These schools would organize themselves explicitly to support working families by limiting the days when school is closed to only major national holidays; offering an 8:30 a.m. to 5:30 p.m. daily schedule; reinventing parent-teacher communication to eliminate parent-teacher conferences at school during the day and allow for more calls, texts, and other one-off, technology-enabled solutions; adopting more parent-friendly health policies; and more. Districts should prioritize providing access to these schools to low-income families and where there is great need. In low-income schools, the district can cover the additional costs through Title I, Part A under the Schoolwide Program. Conduct a comprehensive parent needs assessment. Districts should consult parents in the planning and implementation of their family-centered school schedules. Parent consultation and family needs assessments are paramount to ensuring that new schedules both align with the standard workday and satisfy the needs of local parents. District administrators should also make sure that their outreach is inclusive of households with different income levels and family structures. Create—and fund—new schedules in creative ways. While CAP recommends a systemic approach to redesigning the school day and reforming the calendar year, districts can consider simpler, less-expensive alternatives for meeting the needs of working parents. For example, schools could enlarge the size of certain classes or create experiences for larger groups of students on certain days. Districts could also solicit AmeriCorps members, college students, and community members to facilitate programs during closings or at the end of the school day. They could also proactively send out information about teachers, aides, or other school personnel—known collectively as “sub pools”—who are willing to supervise students for compensation on days off. Leverage community resources and partner with community-based entities. Schools should work with community providers in operating before- and after-school programs on school grounds rather than at facilities located outside the school building. Schools need to break down barriers and make it easier for outside organizations to use the school facilities. In addition, more effective and seamless communication between schools and after-school programs can help align after-school programming with the school day. Such measures would provide better accommodations for low-income families. Under ESSA, Title I-eligible schools may use Title I funds for these purposes. Redefine how professional development is delivered. 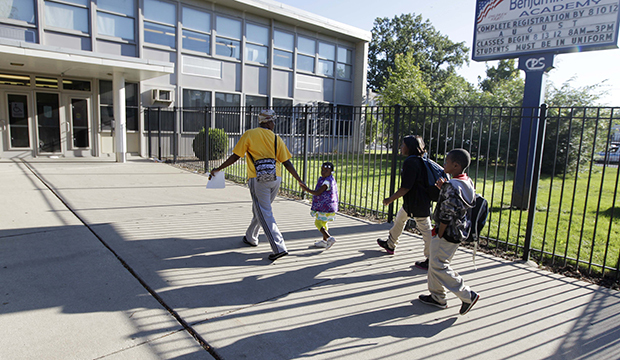 Districts should stop the practice of full-day school closures for professional development. Instead, they should utilize high-quality professional development strategies that can be embedded throughout the school day, including teacher collaboration and planning time, individualized coaching, classroom observations, evaluations from outside experts, and trainings on data analysis. Districts could also run citywide leadership development events during nonschool hours. They could also explore the use of online platforms, such as Knowledge Delivery Systems, for professional development and professional learning among educators, which would reduce the need for full-day closures for these purposes. Better accommodate disadvantaged families and support increased parental involvement. Schools should better respond to the needs of low-income, single-parent, or otherwise disadvantaged family households. First, schools should make every effort to accommodate parents’ work schedules when scheduling parent-teacher conferences, student work expos, or similar events. For instance, schools could provide alternative parent outreach options such as virtual conferences or regular emails and phone calls. Negotiate more efficient bus schedules. Many school districts follow a multitiered busing schedule system in order to save on transportation costs. For example, a single bus can run three routes in one morning instead of three buses running one route each. As a consequence, however, elementary, middle, and high schools start and end their days at significantly different times. Administrators should work with transportation companies to identify alternatives to tiered busing schedules, such as dual-route systems, that would enable all grade levels to follow the same full-time school schedule without significantly increasing costs. Leverage technology to communicate with parents and better target days off. Districts should offer parent-teacher conferences via an online platform such as Skype or replace formal parent-teacher conferences with regular phone calls and emails. A number of technologies, such as Edmodo, have made it easier for educators to share information with parents, and while some advocates have expressed privacy concerns, more schools should take advantage of these potential solutions. Districts could also explore the use of online platforms, such as Knowledge Delivery Systems, for professional development and professional learning among educators, which would reduce the need for full-day closures for these purposes. Align school year calendars and take cues from major employers about emergency closings. Schools within an area should closely align their calendars and scheduling policies. Local officials could bring together school administrators and ask them to work together to devise a unified school schedule. Alternatively, charter and independent schools could align their calendars with the largest public school system in the area. School administrators should also take cues on local emergencies and weather-related closings from major employers in the area. Catherine Brown is the Vice President of Education Policy at the Center for American Progress. Ulrich Boser is a Senior Fellow at the Center. Perpetual Baffour is a Research Assistant for the K-12 Education Policy team at the Center.